Pottery, relief, 3.75L, pewter lid. Richard Wagner (1813-1883) is the acknowledged master of German opera, and one of the most progressive composers in history. 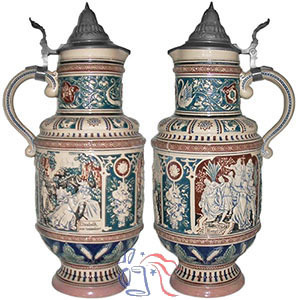 The scenes surrounding this stein are taken from three of his compositions, including: Rienzi, first staged in Dresden in 1842; Tanhäuser, which made its debut at the same Dresden theater in 1845; and the centrally depicted Lohengrin (right), which initially appeared in Weimar in 1850. Master stein to Nos. 1351, 1352 and 1353.